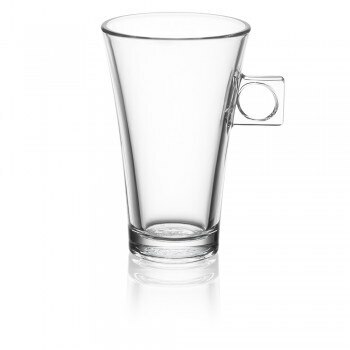 Whether you love our Caramel Latte Macchiato capsule or the Skinny Latte Macchiato is more your style, enjoy your favourite drink in this striking latte glass. A brilliant companion to any of our frothy latte coffee capsules, we’ve specially designed this glass to make the very most of your drink. The beautiful layers of coffee, milk and crema are just a part of what make our latte drinks so special, which is why we think that they should be shown off to their very best. Our stylish latte cups are perfect for doing just that. With elegantly designed details, the clear glass takes your coffee from delicious drink to a coffee creation that’s truly a work of art. Whether you’re unwinding after a long day, or enjoying a latte after dinner with friends, bring the coffee shop experience home with these lovely latte glasses. Suitable for dishwashers, these glasses don’t just look great, but they’re easy to clean too! So, whether you pop in a pod to make a latte for yourself or create coffees for all your friends to enjoy, savour your capsules in style – without the fuss. And if you love our latte glasses, why not give our cappuccino and espresso cups a try? So pleased with these glasses,very modern design,perfect fit for my Dolce Gusto machine,excellent quality they make my Latte look classy. Let's get straight to the point ... they are very expensive for what they are. But then no one at Nestle takes any notice of customer reviews, even when the same complaint is repeated regularly. Pleased with quality but far too expensive. Would have expected at least 4 for £10. These are too expensive for what they are. We already pay a lot for the pods but that doesn't mean we can justify spending £5 on a glass to have our daily treat in. I bought a set of four, with complementary spoons, for £10. They're nicely made heavy latte glasses and unlike these they have a decent size handle so they are more comfortable to hold. That's what I want to be able to buy on here, not an over priced slightly inferior version. order delivered within 2/3days.Would highly recommend. quality throughout first rate staff who are always helpful and obliging. These glasses maybe expensive but they are better quality than high street shops and they are a perfect size the machines!! I bought a couple of much cheaper glasses from Amazon, but when I got them they were too small. These glasses are perfect size and great quality. I'm getting a couple more to complete my set for four. If your already prepared to purchase the machine and coffee don't then cry about the price of the glasses. I have bought some of the Dolce Gusto glasses off Ebay(a lot cheaper) but the quality just wasn't there. I still think they are just a mite too high in price but you get what you pay for. I can see why people are complaining about the price but the quality of these glasses is good and I think worth it. And to top it off I got this set when they was on a free offer which was amazing it also made me go and buy the rest of the sets that they do. before I got this set I was just having my drinks in normal mugs/cups but after having them in a glass it just sets off the presentation of the drink and improves enjoyment.